Leo had a great time last year watching baseball with his grandpa. 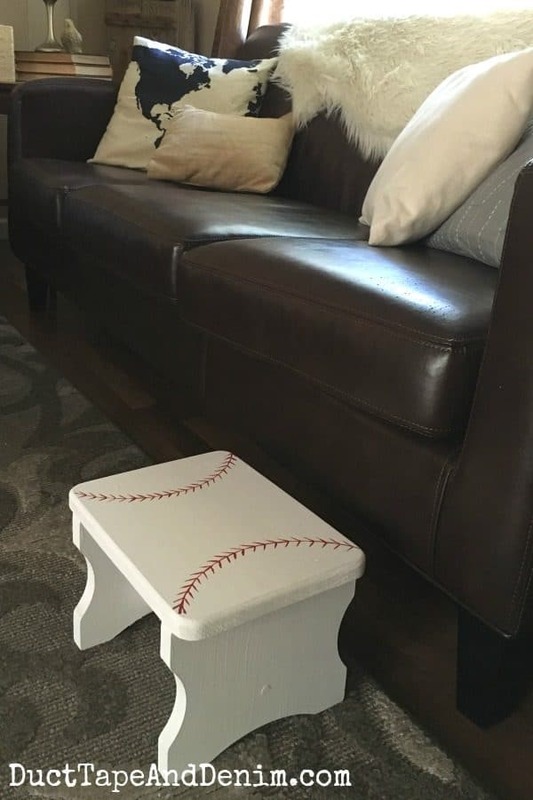 So I thought I’d make him a little stool that he could sit on to watch the game. He got ahold of it before I painted it so you might see a few dirty little footprints on there in the before photo. But they cleaned up and didn’t cause any problem and all when I painted. This post contains affiliate links. You won’t pay any more when you use these but I will earn a small commission on any purchases you make after clicking on them and I greatly appreciate it. Also, DecoArts supplied the paints for this project but the ideas and opinions are my own. Thanks for helping support my little blog!!! 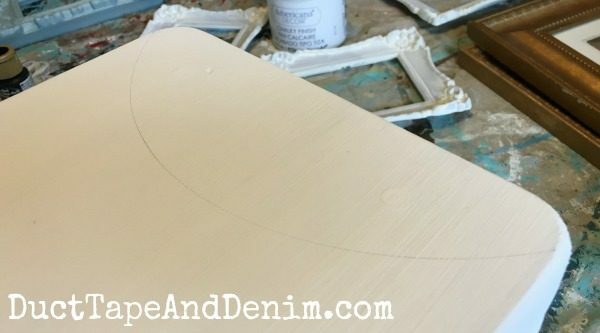 Here’s the stool after one coat of chalky finish paint. 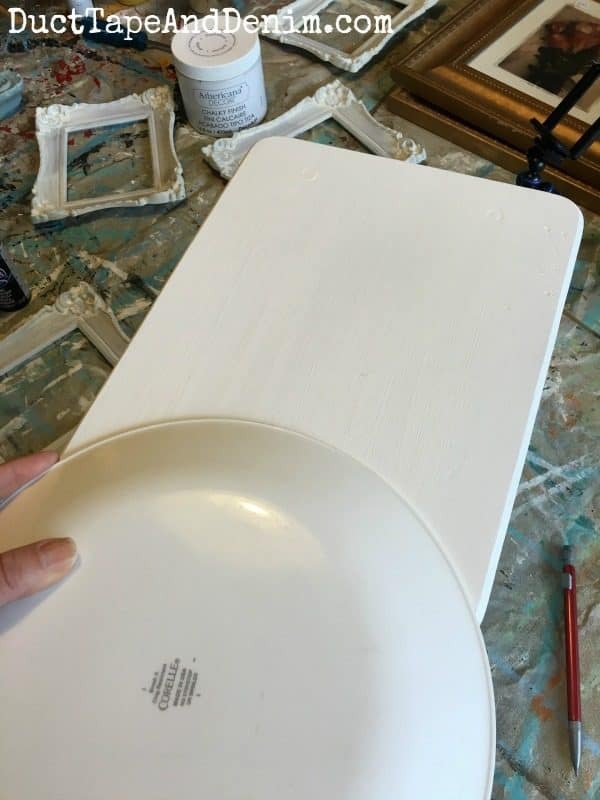 I love using chalk type paints because I’m usually painting on my dining room table (while catching up on YouTube videos!) and there is no smell or fumes with this paint. It took two coats to get good coverage on this project. You can see a few more projects that I was working on that day in the background of the photo below… hopefully I’ll have them posted soon, too. LOVE how the frames turned out! I traced the plate very lightly with a pencil, went over that with a fine tip paint brush in primary red, and then added the stitches on the sides. Like I said, I just did those free hand… no tracing. But if you’re really unsure of your painting go ahead and lighting draw those in first, too. I used a flat tip brush turned on the side. And here’s how it turned out. Not perfect, but I’m happy with it. I thought about adding a name or more details but in the end just decided to leave it simple. This week my old kitty has been using it to get up on the couch. I think she’s getting arthritis. Even jumping that short distance is bothering her. She is about 12 years old now so I guess I should expect that but it’s still kinda sad to see. Thanks for reading, commenting, and sharing my post! 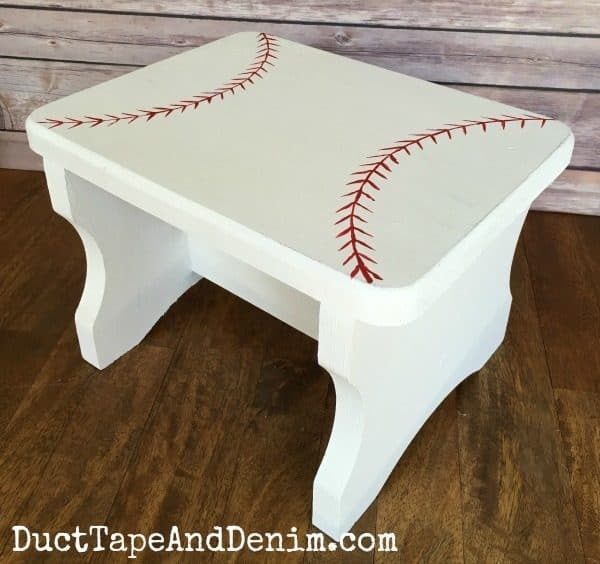 I’d love to make one of these for a gift for my daughter’s son. Super cute. 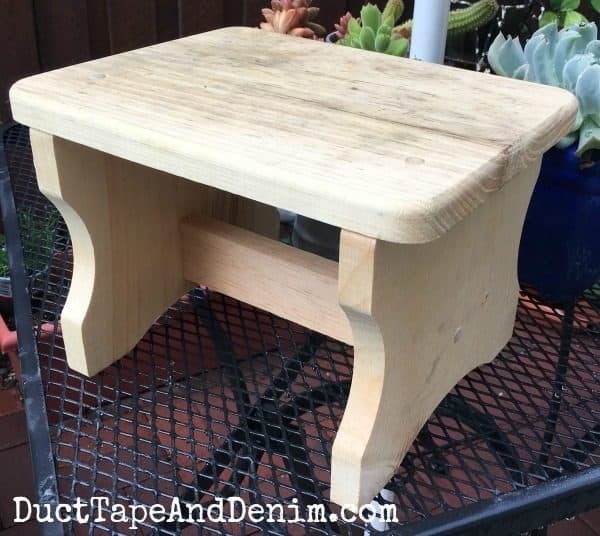 I love how your stool came out! It’s so cute! Thanks for sharing it at Motivation Monday on Mom Home Guide! I love this Ann. You did a great job. This is so cute. 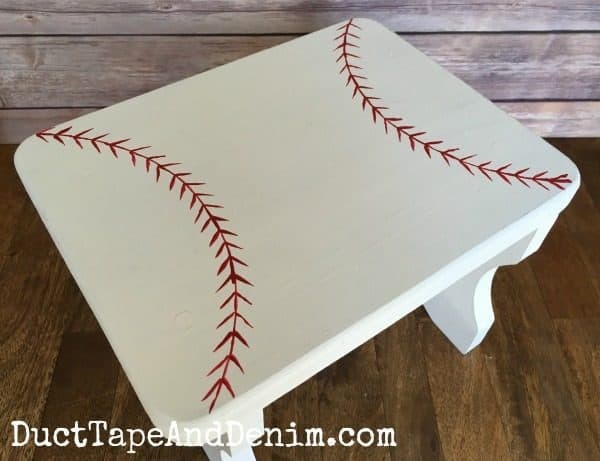 Great gift idea for a kid’s room or the baseball lover. 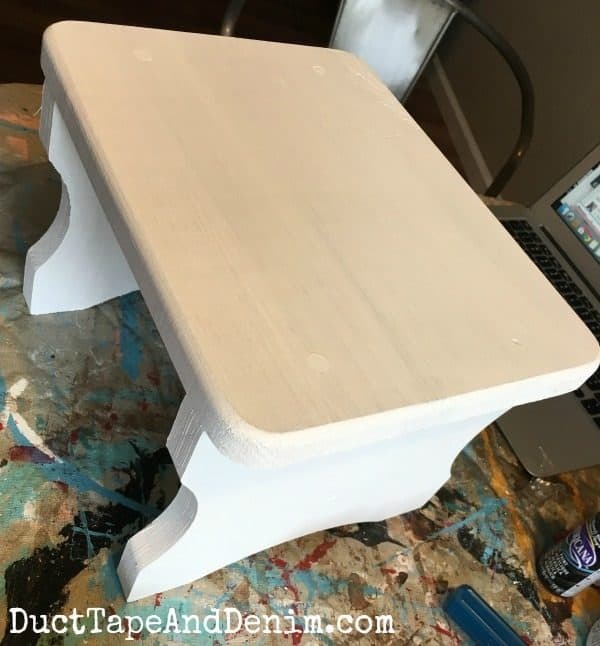 Please share your DIY posts on my Sunday’s Best Linkup. I love great DIY ideas.